Barista Katie Enders demonstrates the art of creative latte pours. A hundred people are crammed into Indaba Coffee's newest location on Riverside in downtown Spokane. It's a loud, raucous after-hours party inside the hip new coffee shop as people stream in from the cold streets into the bustling cafe where there is food, coffee and beer. An hour later, the competition begins. Spectators crowd around the bar with their phone cameras at the ready. Two competitors stand behind the bar. In between the buzz and hiss of the espresso machine, they create rosettas, hearts, tulips and swans with their medium of choice: coffee and milk. Each drink goes to one of the spectators, free of charge. Tonight, the goal isn't to just make a latte. It's about making that latte into a work of art. It looks effortless to the untrained eye, but the technique requires a scientific understanding of coffee and an artistic flair. Judges in the competition are looking for four things. One of the judges, Katie Rivkin, co-owner of Ladder Coffee & Toast, outlines the criteria: Symmetry of the illustration, contrast between the espresso and milk, complexity of the design and measurement of the fluid. Each latte artist has to balance their own artistic ability to meet the demands of the judges. "Some people pour swans because it's more complex," Rivkin says, "but it's not symmetrical." "It just takes a lot of practice," she continues. "It really speaks to the community of the [local] coffee industry. It's a friendly little competition." Latte art competitions are held regularly, often benefiting local nonprofits. These "throwdowns" are commonplace in the coffee industry, and the Inland Northwest is no exception. Baristas, shop owners, roasters and spectators alike come together for the challenge and to support one another. Typically, newly opened shops like Indaba's Riverside location, which launched last fall, celebrate with a throwdown. Proceeds from Indaba's event benefited Cup of Cool Water, a nonprofit providing services for homeless youth. Other events usually pick a local charity beneficiary, too. These latte art throwdowns take the task of serving coffee and raise it to another plane of professionalism, synonymous with the current "third wave of coffee." 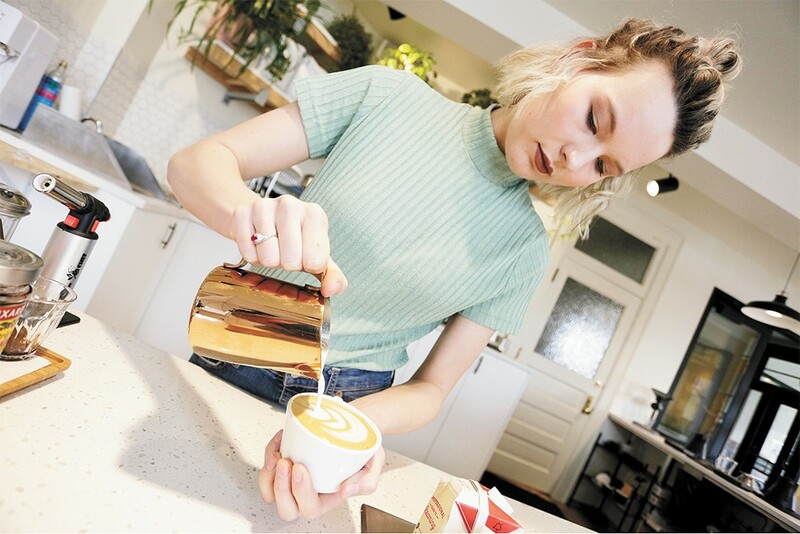 "It all comes down to precision," says Katie Enders, a Ladder Coffee barista and the first-prize winner at the recent Indaba throwdown. "There is so much attention to detail." Enders, 23, graduated from Eastern Washington University with a history degree, which is why she became a barista, she jokes. She's been serving coffee since she was a teenager and has practiced specialty coffee for the last three years, competing in about 10 throwdowns so far. "In the specialty culture, latte art is more about presentation," she says. "It's fun. You can express yourself and it's something you can always improve on." For "freepours," the standard in most throwdowns, competitors mostly focus on steaming the milk and pouring. If you don't know how to steam the milk just right, you're never going to get the right consistency to make art, Enders explains. If you stop steaming the milk too soon, you'll have a foamy mess, says Joshua Jackson, another throwdown competitor, who describes himself as a "freelance" barista. Jackson, also 23 and attending EWU, has been in the business for only a couple years and has competed at more than a dozen throwdowns. Once steamed, pouring the milk is also an exact science. The "speed of the milk" during the pour is crucial to latte art, Enders says. The slower the pour, the more milk shows up in the espresso. 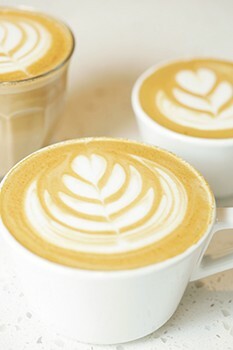 Keep your "paintbrush" — the pitcher of steamed milk — as close to the espresso as possible, Jackson says. "If it doesn't show up immediately, follow it to form." Another important rule, Jackson says: "Don't psych yourself out." There are a lot of eyes on you at the throwdowns, and that can be a little nerve wracking, Enders notes. "It's kind of scary even if you've poured a lot of lattes." The local latte art competitions are mostly casual. Winners get to take home new equipment donated by throwdown sponsors (usually other local roasters or shops) that they can use to continue honing their craft. Serious competitors can take their skills to qualify in the regional competitions with the Specialty Coffee Association. Enders says she's considered competing at that level. The original print version of this article was headlined "Battle of the Baristas"